Die Band Harmonia entwickelte einen völlig eigenen elektronischen Musikstil, den man zwischen Kraftwerk und Tangerine Dream ansiedeln könnte. Allerdings dominiert hier ganz klar der Rhythmus. You’ve heard of Kraftwerk, Neu! and Cluster, right? How about Harmonia? It’s much less likely because, like many trailblazers of their own era, they were ignored at the time. Well, beyond the ‘How to buy Krautrock’ section in your local record shop sits a further, towering wall of German space music to explore and first on your list should be Harmonia. Trust us, it’s worth your time. They’re a vital discovery for anyone who thrills in kicking back and nodding out to motorik grooves, proto-ambience and a relentless, euphoric drive. And, get this, they’re comprised of three of Germany’s experimental music heavyweights, Michael Rother, Dieter Moebius and Hans-Joachim Roedelius – all of whom played in the aforementioned stars of Krautrock. That’s right. Harmonia were formed from the crusts of Kraftwerk, Neu! and Cluster and make up something equally as tantalising as any of those three acts, inspired, according to Moebius, by ‘Velvet Underground, Mozart, Coltrane, Brel, Arabic, Hindu … the list goes on and on.’ Over the years they’ve turned the heads of anyone who’s heard them, such as Brian Eno – who once declared them the world’s most important rock band – David Bowie, the Edge, Aphex Twin and, more recently, Secret Machines, who’ve been known to include a cover of ‘(Deluxe) Immer Wieder’ in their sets. 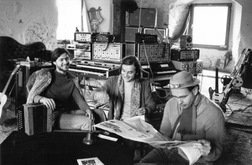 In their short time together (1973-76), the trio released two albums: 1974’s strung-out ‘Musik Von Harmonia’ and the friendlier electro-pop of ‘De Luxe’.